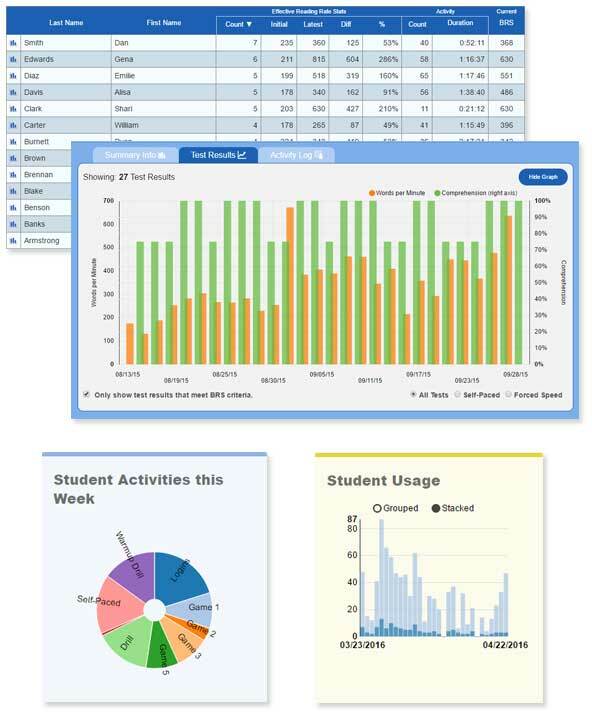 There is a reason why schools continue to use AceReader year after year. Simply put… It works! Who uses AceReader? K-12 Schools through College. The US Air Force Academy, US Naval Academy, California State University Sacramento, and Lewisville ISD are just a few of the customers using AceReader. Plus, our Personal and Family Editions provide the same level of educational value to individual consumers and homeschool families. Since we live in the information age, being an efficient reader has never been more important than it is today, and students are improving their reading skills using AceReader. Improving reading skills leads to improved test scores, better grades, better careers, more knowledge, a desire to learn, and an increase in self-confidence. The benefits are virtually unlimited. Results vary, but typically students save 10 to 25 minutes per hour of reading while maintaining good comprehension after using AceReader for one semester (or about two months of training). Continued use leads to continued improvement. A sophisticated multi-level assessment system allows teachers (and students) to track progress using an apples-to-apples comparison between the time the students start using AceReader and the time they take their last assessment test. AceReader is the only program that uses time-tested, patented and research-based technology with a 20-year proven track record. Sophisticated yet fun, and very simple to use. AceReader includes a large amount of educational content, including more than 1,000 leveled and themed reading comprehension tests. Themes include: American History, Earth & Space Science, Famous People, Fun Facts and SAT/ACT Prep, as well as our main General category. Students get smarter while they learn to be efficient readers. 13 text levels make it ideal for all ages. AceReader includes an advanced eReader used for training that supports many display modes. It comes complete with a wide variety of eBooks and the ability to add to your own library. This is a favorite part of the program for many students, since they can train with material they need to read anyway (i.e. eBooks, documents, web pages, email...). Its flexibility also allows them to use the eReader as a productivity tool. AceReader has won more awards than any other product in its class. These include prestigious education awards from Technology & Learning, BESSIE and EDDIE for innovation and educational excellence. AceReader provides a satisfaction guarantee along with excellent support. We are known for our rapid and high quality support to help you resolve any issue. Call or email any time. AceReader improves students’ silent reading skills. The program does not teach “how to read,” but rather “how to read better,” by improving students’ reading rates, comprehension and fluency. Realistically, we all know that the more you read the better you will get at doing it. But, by using AceReader, with its carefully crafted exercises that are both engaging and entertaining, students will become efficient readers in a shortened period of time. Students go from reading word-by-word to reading chunks (groups) of words at a time, which ultimately leads to a more fluent and gratifying experience. No one cares how fast you can read if you lack good comprehension. Poor comprehension defeats the purpose of reading. 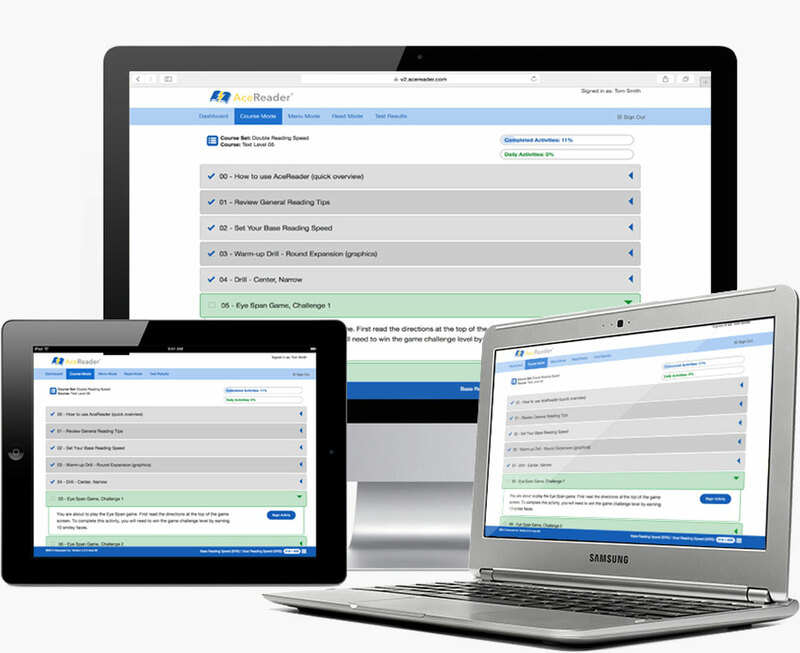 AceReader integrates timed, themed and leveled reading comprehension tests to calibrate the training activities and to track students’ progress. This ensures students maintain good comprehension; both students and teachers can monitor their success. Subvocalization is that little voice you hear in your mind when you are reading silently. Advocates of most speed reading programs tell you that you need to completely eliminate subvocalization in order to increase your reading speed. Research has shown, though, that “elimination” of subvocalization is not possible, and it is not encouraged for someone looking for good comprehension. Having said that, it is possible to minimize subvocalization by eliminating smaller support words, such as “a,” “the” etc. This effectively increases your subvocalization speed. Consider this: It is a fact that many people read at rates above 500 words per minute with very good comprehension. However, it is not physically possible to subvocalize every word when reading at those rates. 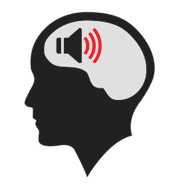 When subvocalizing every word, you are limited to talking speeds, which are typically below 200 words per minute. AceReader recognizes these facts and takes a common sense and practical approach that is supported by reading specialists. Good readers see all the words, but they subvocalize at higher rates and do not subvocalize every word. This breaks the bad habit of reading word-by-word and leads to the ability to read multiple words at a time. AceReader helps students minimize subvocalization and increase subvocalization speeds by pacing them to read at higher speeds relative to their current effective reading rates. Students' effective reading rates are determined from self-paced reading comprehension tests and assessments. Regression is the behavior of letting your eyes wander back over material you have already read. One reason we regress is that we tend to lose concentration, and a primary reason for losing concentration is that we are reading so slowly that our minds have the time to drift. AceReader flashes or highlights text in a manner that keeps you moving forward and at speeds that keep you engaged, thus helping you break the regression habit. It should be noted that when reading difficult and unfamiliar material with new vocabulary, some re-reading may be necessary for good comprehension. Having said that, most of what we read does not typically fall into this category. Even when reading difficult and unfamiliar material, much of the supporting text is not by itself complex, and it does not include new vocabulary. 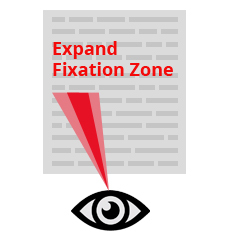 Your fixation zone is the amount of text you can see each time your eyes are fixated (or focused) on a single point. When you read, your eyes move and stop as you go from left to right. Each time your eyes stop, the center of what is most in focus is the fixation point. It is at this point that you see and process the material. Research has shown that fast readers have a larger fixation zone (because you use more of your peripheral vision) than slow readers. When you can see a wider amount of text during each eye fixation, then you have fewer overall fixations and are able to read more efficiently. For example, a better reader may re-fixate once for every two words instead of once (or multiple times) for each word. 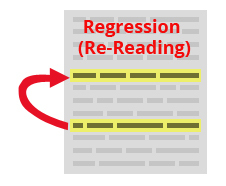 AceReader helps you expand the amount of text you see and comprehend at each fixation zone through the use of activities that flash text at variable widths, then validates that you were able to see and comprehend what was flashed during those bursts. 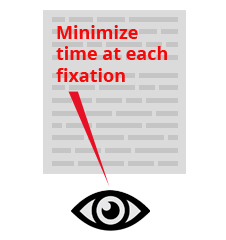 Your fixation time is the amount of time your eyes are stopped while focused on a single point within the text. Less time at each fixation point leads to faster reading. AceReader trains you to spend less time at each fixation point by utilizing activities that flash text for short bursts of time, then validates that you were able to see and comprehend what was flashed during those bursts. Your re-fixation speed is the amount of time that it takes for your eyes to move from one fixation point to the next. 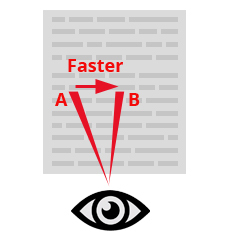 Efficient readers are able to re-fixate at higher speeds. AceReader helps train you to re-fixate at higher speeds by pacing you to read at higher speeds. The program will flash or highlight text to guide and pace your reading. Speeds continually auto-adjust based on your timed reading comprehension test scores.